A few weeks ago, Lewes visited FA Cup giant killers Harlow Town and came away with a shock of their own after the Ryman League One North side came from two goals down to win three-two in the FA Trophy. Today we were on the road again to another club whose exploits were inscribed on the fabric of the cup, Leatherhead FC. The year was 1975. 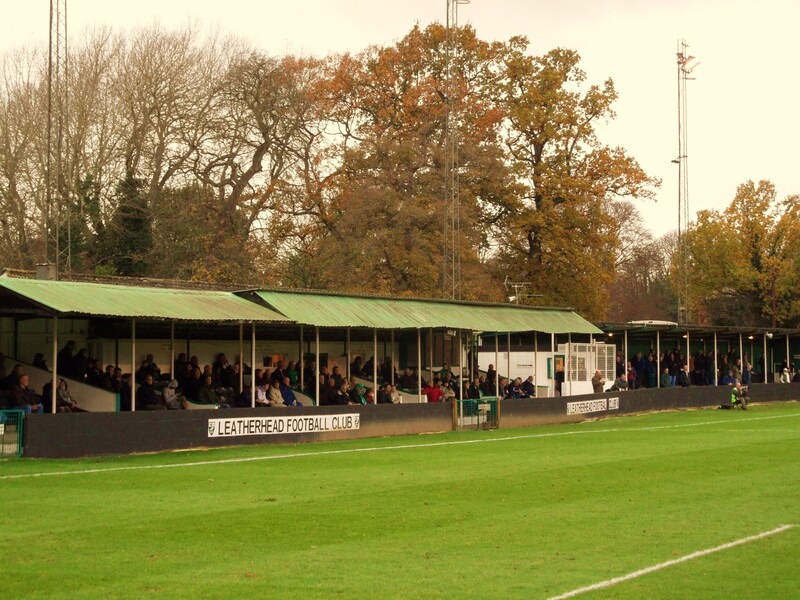 The Tanners then of the Isthmian League had gone on a mazy run in the FA Cup and had beaten Bishops Stortford, Colchester United and Brighton & Hove Albion to set up a fourth round tie at home to 1st division Leicester City. In a move that today would be “banned”, the game was switched to Filbert Street on request of Leatherhead to maximise the revenue earning potential and over 32,000 fans and the Match of the Day cameras crammed in the ground to see the non league side take a two goal lead. Star of the show (and of the club) was a chap called Chris Kelly who liked to talk up not only the team’s abilities but those of his own and earned him the nickname, The Leatherhead Lip. Unfortunately fitness saw the 1st division side score three goals to take the tie but the Tanners held a place in many neutrals heart (A great article on their cup run can be found here). Today they still ply their trade in the top level of the Isthmian league after promotion via the play offs last season under legendary manager Mick Sullivan. Sullivan didn’t take fools gladly but was a great non league character and we will be ever grateful for the signed shirt he donated to Lewes’s Rook Inn last season. 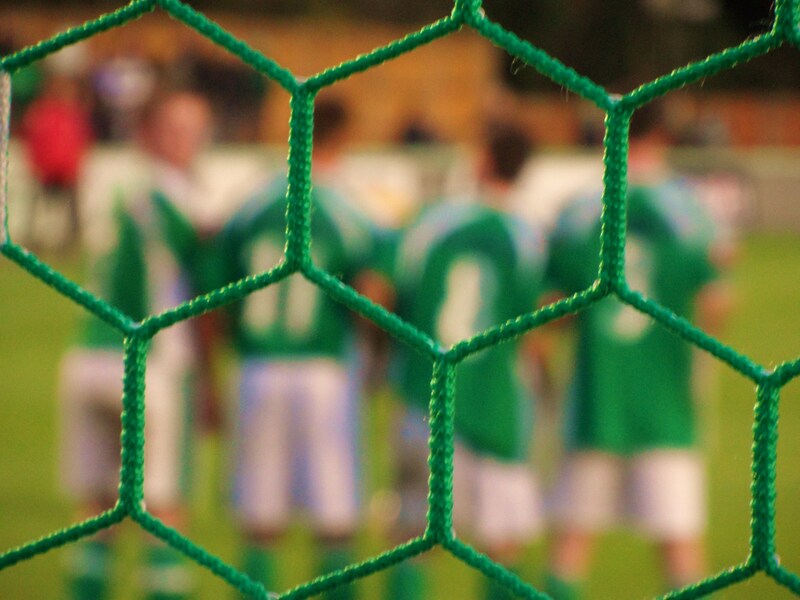 This season the club started poorly, and ultimately Sullivan paid the price as he departed Fetcham Grove after just two points from their first nine games. After Lewes’s last gasp defeat to East Thurrock United on Wednesday a win was more important than ever. On Friday one phone call sent the club into crisis though. On loan keeper Fabian Spiess had been injured in training with his club Notts County. With no other keeper at the club the phone calls started. It was looking like I was going to be dusting off the old Uhlsports and doing a John Burridge and sleeping with a ball, just to get ready until I got a call from Club Secretary Kev. A deal had been done to bring back Rikki Banks from Eastbourne Borough for the month. Banks was a hero in our survival season two years ago, and would be welcomed back again, starting with the trip to Leatherhead. Also joining the squad was Harry Harding, previously with Reading and Bromley. As with all new signings I try and get a bit of information. On the gospel that is Wikipedia Harry was either a 65 year old American Political Scientist who wrote “Sino-American Relations, 1945-1955: A Joint Reassessment of a Critical Decade” or that he was the Canadian Minister of Government Services for Newfoundland and Labrador. Hmm, I think it was more likely to be on Twitter come to think of it. This as a short trip for TBIR – 30 minutes around the M25 and down into Mole Valley. I cannot see that word without recalling of Ever Decreasing Circles, the BBC Sitcom from the 80’s starring Richard Briers where he played an obsessive, compulsive chap living in middle England hell. He worked for a fictious company called Mole Valley Valves. 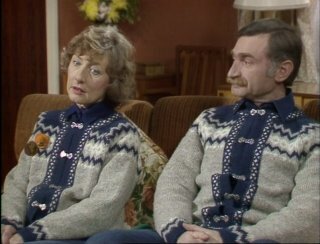 As I parked at the ground a couple walked past with matching coats on – very Howard and Hilda. 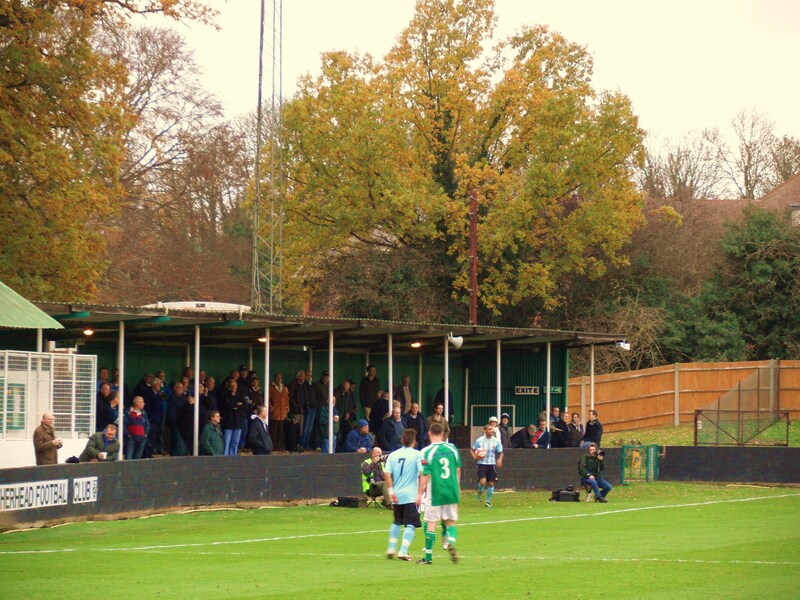 Leatherhead’s Fetcham Grove ground is one of the finest in the south of England in terms of location. Nestled next to the River Mole and surrounded by trees it is perfectly complimented by the autumnal colours, falling leaves and the ramshackle old stands of the Tanners. If only all non league grounds had so much character. With this being a short hop and a skip for most Lewes fans, the turn out was high, including the veritable Rob K Read, the brains and brawn behind the world famous Lewes Membership scheme, forming a formidable Twitterati to report on the game. 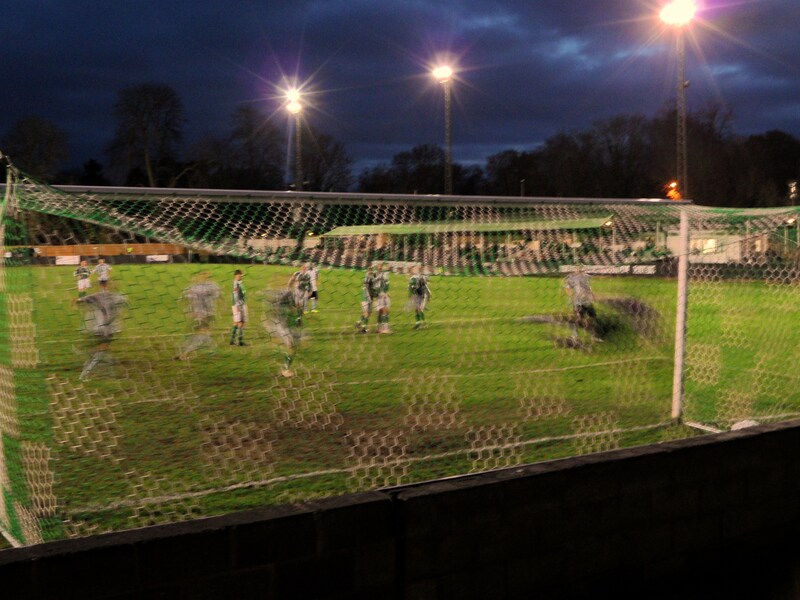 Leatherhead 0 Lewes 1 – Fetcham Grove – Saturday 26th November 2011 With half a dozen fans poised with their fingers on the iPhone buttons to send news of the unfolding events to the world all we needed was something to report on. Well we waited, and waited and waited. On forty minutes the highpoint of the half occurred. Young George, son of ClubSec Kev made a dash for freedom from his buggy and felt he could do better than any of the twenty outfield players, making it as far as the corner flag before being thwarted. Neither team created much despite almost perfect playing conditions. Lewes welcomed back Matt Somner in the middle of the park and he was joined by new signing Harding, with his “unusual” hair. It would be interesting to see who will now monopolise the hairdryer before the game between him and Nanetti. With only Booth up front and five in midfield it was clear on Steve King’s intentions – stop Leatherhead passing through the middle. And it worked, although the Rooks created few chances themselves in the opening period that could trouble the Tanners keeper. After a refreshment stop in the bar, and a welcome pint of Harveys (the fans not the players), the second half started with more of the same. However, it took a number of changes from the bench to change the game. Malcolm came on for Nanetti and with that Lewes became more positive. The corner count started mounting and with Albert Jarrett and Malcolm cutting in from the wings, the Leatherhead defence took to strong-arm tactics to stop them. With ten minutes to go Booth was scythed down on the edge of the area and Malcolm’s free kick could not have been more perfectly flighted into the top corner of the net. Relief washed over the fans, players and management alike. Whilst the team have sat in the play off spots for weeks, form has been disappointing and at this stage we would all take a win at whatever cost. The final minutes saw some nerves defending from Lewes, which always looks worse from the far end, but in the end they held out. It is all about the result, not the performance at this stage of the season (is that right, or is that pre-season?) and the win solidifies the Rooks place in the top five. Next stop – East Grinstead United in the Sussex Senior Cup. You can stick your Nou Camp, San Siro and Allianz Arena. It’s the GAC Stadium for us on Tuesday and we couldn’t be more excited.